Decorating a house for children. It doesn’t have to be an either-or situation when you are designing a home occupied by children versus just adults. How about choosing a style that works for both? It only takes cleverness and foresightedness to consider roughhousing, clutter, spills, fingerprints and the other things that come with family life. A perfect style solution to this predicament is to go modern. A clean-lined, casual and comfortable style works for many families. Modern houses offer an abundance of choices and relatively inexpensive costs because the idea is to be minimal. Modern houses avoid couches and chairs with draped fabric skirts that attract dust, dirt and pet hair. Instead, modern houses rely on durable, practical and streamlined pieces of furniture that are easy to clean. Buy durable furniture with materials that can withstand the wear and tear of children. Look for couches and chairs with kiln-dried hardwood frames. Kiln drying gets rid of most of the moisture in the wood, keeping it from weakening. Corner blocks add to the strength and stability of a piece. They are invisible from the outside as they bolt to both sides of interior corners. These touches make a piece sturdier and roughhouse proof. For fabric choices, consider a heavy fabric with a flat weave or a microfiber, which is soft, simple to clean and versatile. Microfiber comes in a multitude of color choices. You might also consider a sturdy leather. While most people think leather doesn’t suit having kids, it takes a beating and wipes clean. Try to avoid lighter shades. But even with a cream color, it’s a cinch to clean leather— unless you spill a glass of red wine. When my children were little, we had a modern brown leather couch that was a sectional and opened up. Each section became an individual bed that the kids loved. It lasted from spit ups and dirty diapers to soccer shoes and dirty dogs. Tables and cabinets pose challenges as they tend to be hard edged, and safety is a top priority around children. Round tables should save you the heartache of injuries from sharp edges when your toddler tumbles. Even with a modern design, you can choose a rustic motif that offers an eco-friendly look with distressed surfaces, natural hardwoods and design elements. Popular and easy to accomplish, an eco-friendly aesthetic aligns with the times and the environment. It also hides the battering your house is sure to incur. If you can’t afford a new sofa or chairs, you have a few choices. One is to purchase slipcovers of a sturdy, washable and non-shrinking fabric. Select a tight-fitted slipcover that doesn’t look like a slipcover. Again, use color, textures and patterns that camouflage “oopsies” moments as well as markings from dirty hands and faces. Seek ready-made covers that fit your sofa well or find a slipcover maker that measures accurately, puts in strong zippers and sews solid seams to withstand jumping and bumping. It’s worth the extra investment for the added quality. Another tip for the living room is to have a couple of large pillows, again of durable, washable yet colorful fabric, that your children can lay on and sit on in front of the TV or when playing on the floor. These are simple to replace and kids love them. My kids pull huge pillows up to the coffee table in the family room when they’re having a snack on the table. It’s a great way to save the sofa. Also plan for the flow of traffic. Create an open lane through rooms by placing the furniture to allow for running children. Additionally, limit the amount of furniture in a room. Less is more these days. Look at magazines for ideas to make this open design work. Think of a modern hotel room or lobby and the open spaces that are created for the flow of traffic. I recently remodeled my kitchen. Although I could have extended the counter top to have a longer island, I opted to maintain an open space. It was the best move I ever made. We now use the open floor as a dance floor, and it makes the kitchen feel twice as large. If you have a lot of works of art or valuables, put them up high, at least 45 inches above the floor. Do not place heavy items on a shelf or surface where they can topple down. Use earthquake proofing materials, which you can find in a hardware store, to secure that big vase or wooden sculpture placed away from the flow of traffic. Better yet, find a sturdy display cabinet to gather all of your smaller pieces in one place. If you find a cabinet with locking doors, all the better. 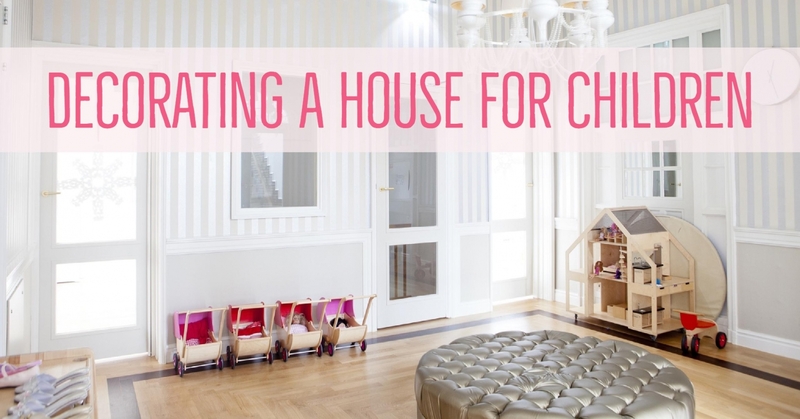 Sometimes a separate playroom or spacious children’s bedroom is not an option. In this case, create a separate small space for children in a corner, alcove or hallway that is out of the way. Find a cabinet at a garage sale or flea market that can house all of your child’s toys. I used to have a hall closet dedicated to my child’s toys. All I had to do was close the door when people came over. If you have a spare closet, give it to your kids. Another idea is to use a padded storage ottoman or bench for keeping playthings out of sight. Such pieces of furniture are practical as you can use them to sit on and store things in at the same time. Pieces that do double duty are always a great investment and way to economize. Look for flooring that is easy to maintain and can handle everything from dropped toys to unsteady toddlers. With modern décor, wood is pleasing and practical. It also eliminates the mites, critters and allergens that thrive in carpets. When I recently redid my kids’ rooms, I removed the carpets and refinished the preexisting wood floors. With wood or tiled floors, think about using area rugs to soften the space and add a touch of protection against the hard surface. Plant-based fibers to consider include jute and seagrass. They lend a casual look. Machine-made versions of these area rugs now incorporate cotton in the weave, giving a softer feel underfoot. Wool or wool blends create even more softness, and because of the lanolin content in wool, it repels moisture and dirt. Paint is one of the fastest ways to change the look of a room. My suggestion is to use paint that has low or no volatile organic compounds (VOCs). These carbon-based, chemical compounds lurk in many paints, floor materials and adhesives. Symptoms of VOC exposure include headaches, an increase in asthma attacks, eye irritation, pneumonia, coughing and fatigue. Most paints are now water based, but the VOC content varies. Ask for paint with little or no VOCs at a home improvement store. You will be a healthier and happier family, and there won’t be that awful paint smell that lingers for months. Children are only children for so long. It’s over far too quickly. Make this period of your family’s life enjoyable while keeping your eye on design. Leading lifestyle expert Susie Coelho is a TV host, bestselling author and designer for Grandin Road. A Space of Their Own By Susan Varsames, M.Ed. Organizing the home for children with special needs. Bold or Simple By Dena Fishbein Ways to make your child’s room unique. 'Tis the Season for Saving By Sarah Welch Having cost-conscious holiday festivities. 10 Tips for Cruising By Kara Mayer Robinson Hit the high seas with kids in tow.